What Is Kidney Stones in Children? What Are Possible Complications of Kidney Stones? What Is the Follow-up for Kidney Stones? The kidney acts as a filter for blood, removing waste products from the body and making urine. It also helps regulate electrolyte levels that are important for body function. Urine drains from the kidney through a narrow tube called the ureter into the bladder. When the bladder fills and there is an urge to urinate, the bladder empties to the outside through the urethra, a much wider tube than the ureter. In some people, chemicals crystallize in the urine and may form a kidney stone. These stones are very tiny when they form, smaller than a grain of sand, but gradually can grow over time to an inch or larger. Urolithiasis is the term that refers to the presence of stones in the urinary tract, while nephrolithiasis (nephro = kidney + lithiasis = stone) refers to kidney stones and ureterolithiasis refers to stones lodged in the ureter. The size of the stone is important, but where it is located and whether it obstructs or prevents urine from draining can be just as important. When the stone sits in the kidney, it rarely causes pain, but when it falls into the ureter, it acts like a dam. As the kidney continues to function and make urine, pressure builds up behind the stone and causes the kidney to swell. This pressure is what causes the pain of a kidney stone, but it also helps push the stone along the course of the ureter. When the stone enters the bladder, the obstruction in the ureter is relieved and the symptoms of a kidney stone are resolved. When a tubular structure is blocked in the body, waves of pain occur as the body tries to unblock the obstruction. These waves of pain are called colic. This is opposed to non-colicky type pain, like that associated with appendicitis or pancreatitis, in which movement causes increased pain and the patient tries to hold very still. Renal colic (renal is the medical term for things related to the kidney) has a classic presentation when a kidney stone is being passed. The pain is intense and comes on suddenly. It may wax and wane, but there is usually a significant underlying ache between the acute spasms of pain. It is usually located in the flank or the side of the mid back and may radiate to the groin. Males may complain of pain in the testicle or scrotum. The patient cannot find a comfortable position and often writhes or paces with pain. Sweating, nausea, and vomiting are common. Blood may or may not be visible in the urine because the stone has irritated the kidney or ureter. Blood in the urine (hematuria), however, does not always mean a person has a kidney stone. There may be other reasons for the blood, including kidney and bladder infections, trauma, or tumors. Urinalysis with a microscope may detect blood even if it is not appreciated by the naked eye. Sometimes, if the stone causes complete obstruction, no blood may be found in the urine because it cannot get past the stone. If an infection is present along with a kidney stone, fever, and chills may occur. Geographical location: There may be a geographic predisposition to forming kidney stones, so where a person lives may make it more likely for them to form kidney stones. There are regional "stone belts," with people living in the southern United States having an increased risk of stone formation. The hot climate in this region combined with inadequate fluid intake may cause people to be relatively dehydrated, with their urine becoming more concentrated and allowing chemicals to come in closer contact to form the nidus, or beginning, of a stone. Diet: Diet may or may not be an issue. If a person is susceptible to forming stones, then foods high in animal proteins and salt may increase the risk; however, if a person isn't susceptible to forming stones, diet probably will not change that risk. Medications: People taking diuretics (or "water pills") and those who consume excess calcium-containing antacids can increase the amount of calcium in their urine and potentially increase their risk of forming stones. Taking excess amounts of vitamins A and D are also associated with higher levels of calcium in the urine. Patients with HIV who take the medication indinavir (Crixivan) may form indinavir stones. Other commonly prescribed medications associated with stone formation include phenytoin (Dilantin) and antibiotics like ceftriaxone (Rocephin) and ciprofloxacin (Cipro). The occurrence of a kidney stone in a child is a relatively rare event. In countries where plants are the main source of protein in the diet, for example, Southeast Asia, the Middle East, India, and Eastern Europe, the frequency of kidney stone disease in children rises. In developing countries, kidney stones made of uric acid are more commonly found. Symptoms of kidney stones in children are similar to those in an adult, although, with very young children or infants, the symptoms may be harder to appreciate and understand. The initial finding in an infant may be a crying and inconsolable baby, and the presentation may be mistaken for colic. 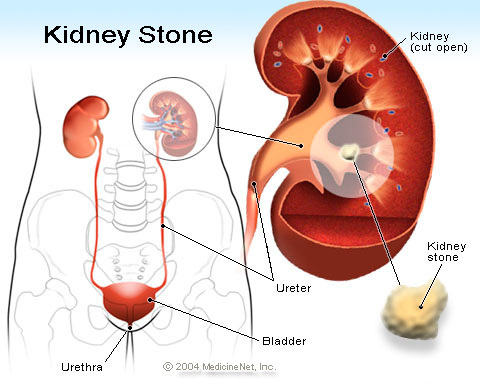 Some stones grow very large and fill the entirety of the kidney collecting system. They are called staghorn calculi (calculus = stone) because they look like antlers. While most kidney stones are made up of calcium oxalate crystals, this type of stone is a composite of struvite, carbonate, and apatite. They are usually the result of recurrent urinary tract infections, in which the bacteria produce ammonia, allowing chemicals in the urine to form the nidus for stone formation. The classic presentation of renal colic associated with blood in the urine suggests the diagnosis of kidney stone. Many other conditions can mimic this disease, and the care provider may need to order tests to confirm the diagnosis. In older patients, it is always important to at least consider the diagnosis of a leaking or ruptured abdominal aortic aneurysm (abnormal widening of the large blood vessel that leads from the heart to supply blood to the body) as a source of this type of pain. Physical examination is often not helpful in patients with kidney stones, aside from the finding of flank (side of the body between the ribs and hips) tenderness. The examination is often done to look for potentially dangerous conditions. The care provider may palpate or feel the abdomen trying to find a pulsatile or throbbing mass that might indicate the presence of an abdominal aortic aneurysm. Listening to the abdomen with a stethoscope may reveal a bruit or rushing noise made by abnormal blood flow through the aneurysm. Tenderness under the right rib cage margin may signal gallbladder disease. Tenderness in the lower quadrants may be associated with appendicitis, diverticulitis, or ovarian disease. Examination of the scrotum may exclude a testicular torsion. In children, colicky abdominal pain may be associated with intussusception of the intestine. A urinalysis may detect blood in the urine. It is also done to look for evidence of infection, a complication of kidney stone disease. Sometimes, crystals may be seen in the urine and can give a clue as to what type of stone might be present. Ultrasound is another way of looking for kidney stones and obstruction and may be useful when the radiation risk of a CT scan is unwanted (for example, if a woman is pregnant). Ultrasound requires a specially trained person to obtain and interpret the images. That person might not always be present. Emergency physicians are increasingly being trained to use ultrasound at the bedside. If ultrasound can make the diagnosis, a CT may not necessarily be ordered. In those patients who already have the diagnosis of a kidney stone, plain abdominal X-rays may be used to track its movement down the ureter toward the bladder. CT scans should be limited to no more than one per year unless absolutely necessary to minimize radiation exposure. Prevention is always the preferable way to treat kidney stones. Remaining well hydrated keeps the urine dilute and helps prevent kidney stones from forming. Maintaining dilute urine is the most important intervention for stone prevention. Those who have never passed a kidney stone may not appreciate the severity of the symptoms. There is little a person can do at home to control the debilitating pain and vomiting that can occur with a kidney stone other than to seek emergency care. If this is the first episode and no previous diagnosis has been established, it is important to be seen by a physician to confirm the diagnosis and a urologist for treatment. For those who have a history of stones, home therapy may be appropriate. Most kidney stones, given time, will pass without treatment, and treatment is directed toward symptom control. The patient should be instructed to drink plenty of oral fluids. Ibuprofen may be used as an anti-inflammatory medication and for pain relief if there is no contraindication to its use. If further pain medication is needed, the primary care physician or urologist may be willing to prescribe stronger narcotic pain medications. Please note, if a fever is associated with the symptoms of a kidney stone, this becomes an emergency, and medical care should be accessed immediately. Urinary tract infections associated with a kidney stone often require urgent assessment and may need intervention by a urologist to remove or bypass the stone. In the emergency department, intravenous fluids may be provided to help with hydration and to allow the administration of medications to control pain and nausea. Ketorolac (Toradol), an injectable anti-inflammatory drug, and narcotics may be used for pain control, with the goal being to relieve suffering and not necessarily to make the patient pain free. Nausea and/or vomiting may be treated with anti-emetic medications like ondansetron (Zofran), promethazine (Phenergan), or droperidol (Inapsine). The decision to send a patient home will depend upon the response to medication. If the pain is intractable (hard to control) or if vomiting persists, then admission to the hospital may be necessary. Also, if an infection is associated with the stone, then admission to the hospital will be considered. Pain control at home follows the lead of the hospital treatment. Over-the-counter (OTC) ibuprofen (Advil) is used as an anti-inflammatory medication, and narcotic pain pills may be provided. Antinausea medication may be prescribed either by mouth or by suppository. Tamsulosin (Flomax, a drug used to help urination in men with an enlarged prostate gland) may be used to help the stone pass from the ureter into the bladder. Because of their size or location, some stones may not be able to be passed without help. If the stone does not pass, then a urologist may need to consider using lithotripsy, or shock wave therapy (ESWL), to break the stone up into smaller fragments to allow those small pieces to pass more easily into the bladder. Shock waves are a type of ultrasound that fragments stones. If the stone is located in a place where lithotripsy cannot be used, or if there is a need to relieve the obstruction emergently (an example would include the presence of an infection), the urologist may perform ureteroscopy, in which instruments are threaded into the ureter and can allow the physician to use a laser to fragment the stone. Occasionally, the urologist may be able to use instruments to grab the stone and remove it. Since most patients have two kidneys, a temporary obstruction of one is not of great significance. For those patients with only one kidney, an obstructing stone can be a true emergency, and the need to relieve the obstruction becomes greater. A kidney that remains completely obstructed for a prolonged period of time may stop working. Infection associated with an obstructing stone is another emergent situation. When urine is infected and cannot drain, the situation is like an abscess that can spread the infection throughout the body (sepsis). Fever is a major sign of this complication, but urinalysis may show an infection and cause the urologist to consider placing a stent, nephrostomy tube, or removing the stone to relieve the obstruction. Antibiotics use may be considered. For the first-time kidney stone patient, there should be an attempt to catch the stone by straining the urine, so that it can be sent for analysis. Also, blood tests and a 24-hour urine collection may be done to try to determine a cause for the stone formation. While most stones are made of calcium oxalate, stones can also consist of other chemicals. It may be possible to prevent future stone formation by taking medications. Drinking plenty of water will help push the stone down the ureter to the bladder and hasten its elimination. A follow-up visit with a urologist may be arranged one to two weeks after the initial visit, allowing the stone to pass on its own. Patients should call their physician or return to the emergency department if the pain medication is not working to control the pain, if there is persistent vomiting, or if a fever occurs. While kidney stones and renal colic cannot always be prevented, the risk of forming a stone can be minimized by avoiding dehydration. Keeping the urine dilute will not allow the chemical crystals to come out of solution and form the beginning nidus of a stone. Making certain that the urine remains clear and not concentrated (dark yellow) will help minimize stone formation. Medication may be prescribed for certain types of stones, and compliance with taking the medication is a must to reduce the risk of future episodes. Some home remedies to prevent kidney stones may or may not work. While cranberry juice may protect against urinary tract infections and decrease the risk of struvite stones, its properties increase the risk of forming the more common oxalate and uric acid stones. Apple juice contains oxalate and may increase the risk of stone formation. Lemonade or lemon juice can help prevent kidney stone formation. Once a patient has passed a stone, there is a great likelihood that another stone will be passed in his or her lifetime. Since kidney stones may also be hereditary, this likelihood is passed on to the next generation. A patient who has experienced a stone is unlikely to forget the experience and often will arrive at the health-care facility already knowing the diagnosis. Those with recurrent stones may be given medication to keep at home should symptoms recur. Wolfson, A.B. Harwood-Nuss' Clinical Practice of Emergency Medicine. 4th ed. Philadelphia: Lippincott, Williams and Wilkins, 2005. What treatment was effective for your kidney stones?